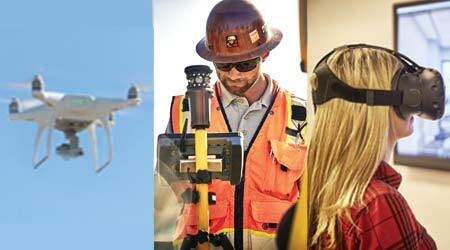 Drones, virtual reality, and other cutting edge technology can make construction easier and more efficient. But make sure you're using tech effectively. Construction technology continues to reshape the planning, design, construction, and life-cycle management of facilities. From drones, to virtual and augmented reality, to cloud-based facility management software, a growing array of technology tools has the potential to simplify and enhance traditional approaches to building and managing facilities. With all of the hype surrounding this technology, however, it can be confusing to understand which tools make sense for you and your organization. Sometimes, technology tools won’t tangibly contribute to the goals or bottom line of a project. Exciting as new technology may be, if it doesn’t deliver meaningful data, insights, or accuracy to a project, it probably isn’t worth integrating. Here are a few specific questions that facility managers can use to help them evaluate whether a potential technology is worth considering for a new construction or renovation project. 1. Will it improve team communication? Because construction projects change on a daily — sometimes hourly — basis, collaborative, cloud-based platforms have become key tools for enabling team members to access accurate, up-to-date project information in the field. And the larger and more complex a project is, the more challenging it can be to ensure every team member is aligned. Washington University in St. Louis is currently undergoing a major expansion project that involves eight separate components, including new structures, building expansions and renovations, an underground parking garage, and new outdoor green spaces. Technology is facilitating the ongoing planning and coordination that must take place among members of the diverse project team, including several different design firms and a construction team of onsite staff, subcontractors, and trade professionals. The use of sophisticated 4D planning tools, which integrate scheduling elements into the 3D model, provide a common roadmap for everyone to follow to coordinate and deliver this fast-track project. 2. Will it help stakeholders visualize and fine-tune the space before it’s built? One of the most significant challenges of any building project is how to optimize the facility so it meets the needs and preferences of its end users. This includes ensuring that life-cycle maintenance is considered before decisions are finalized. With technologies such as virtual reality (VR) and augmented reality (AR), building owners, operators, and end users can visualize and influence the facility’s final form before it’s built. VR enables users to experience full immersion into the 3D virtual environment so they understand how the completed space will look and feel. AR takes that concept a step further by superimposing a computer-generated virtual model in a real-life, mixed reality environment so users can experience and provide feedback on how spaces will function. In an operating room, for example, doctors can use their hands to interact with the OR table and other equipment to determine how well it will serve their needs. It’s much better to fine-tune those details early on in the design process than when the space is constructed and the doctor is not satisfied with the layout. 3. Will it improve quality or precision? Laser scanning is a valuable technology tool that allows construction teams to quickly collect an abundance of highly accurate 3D data in a point cloud format. Originally developed as a law-enforcement tool for accurately documenting crime scenes, laser scanning has also become useful in documenting and verifying existing conditions on facility renovations, coordinating the activities of trade partners, and authenticating the accuracy of construction conditions relative to the design intent and contract documents. It can help identify issues ahead of construction so they can be documented and corrected before negatively impacting the project. At Sarah Bush Lincoln Health Center in Mattoon, Ill., a 3D laser-scanning device guided construction of a 70,000-square-foot cardiovascular expansion. Because laser scanners can provide precise measurements down to one-sixteenth of an inch, construction teams were able to identify inaccuracies that aren’t visible with the naked eye. This precision is often helpful in identifying discrepancies between drawings and reality. During an expansion of Mercy Heart Hospital in Springfield, Mo., laser scanning of the existing facility revealed that the as-built drawings depicted an entire column bay that differed from the physical environment by one foot. The roof drains also varied from the as-builts, with a few positioned in what was intended to be a new doorway. Needless to say, identifying these inaccuracies in advance was extremely valuable for keeping the project on track and moving forward. 4. Will it save time, money, or other resources? Unmanned aerial vehicles — or drones — are increasingly used for land surveillance, site analysis, and aerial safety assessments. Because drones can collect and report data more quickly and accurately than traditional methods of surveying, they can save time and overall costs. By overlaying design files onto drone maps, project teams can pinpoint constructability challenges in preconstruction, identify mistakes, and measure progress during construction. Drones can also survey geo-spatial details of the entire site — everything from utility poles to sidewalks and other surface areas. To document the progress of site excavation work at Washington University, a drone captured high-resolution aerial images during daily 12-minute flights. These photographs — and accompanying data — were uploaded and shared with the construction team so they could assess project progress and adapt the schedule accordingly. 5. Will it equip the facility team with valuable data for future renovations? Flexibility is a high priority for most organizations to ensure their facilities can efficiently adapt to future requirements and opportunities. And technology can help capture accurate data that can be accessed and used throughout the life of the facility. At Washington University, an underground parking garage is programmed with built-in flexibility so it has the potential to be repurposed into academic research or teaching space in the future. The construction team laser-scanned all the post-tensioning cable, rebar, and embedded MEP systems to capture precise data before the concrete was poured on the deck and the garage was buried under landscaping. If there’s ever a need to excavate the garage to renovate or repurpose it, the university will be able to access these 3D scans from its internal GIS system and know exactly where everything is located, within millimeters of accuracy. Of course, data is only valuable if it’s delivered in a digital or print format that owners can immediately access and continue using throughout the life of the facility. Some facility managers are developing Building Information Modeling (BIM) guidelines to ensure their design and construction partners are gathering data in a consistent, useful way. Others are leveraging a universal data standard known as Construction Operations Building Information Exchange (COBie). Originally developed by the U.S. Army Corp of Engineers, this non-proprietary data structure can be customized to meet the facility data needs of any facility manager. At the end of the day, technology should tangibly contribute to the bottom-line goals of a building project. And that’s the primary factor that building owners, facility managers, and their partners should use in evaluating whether to integrate any of the advanced technology tools available to them. Alex Belkofer is virtual design and construction director at McCarthy Building Companies.